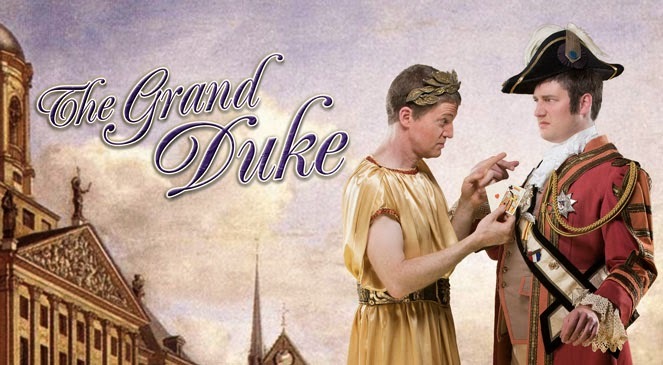 Theatre Eddys: "The Grand Duke, or The Statutory Duel"
Little wonder that Gilbert and Sullivan’s The Grand Duke, or the Statutory Duel has been rarely produced since its premiere in 1896 at the Savory Opera. This final and least successful collaboration by the famed duo pushes three hours in length; has an extremely complicated and silly plot (even in G&S standards); has a higher dialogue-to-music ratio than most of their other, hit successes; and is a mixture of many disparate music types and genres. But as currently produced by Lamplighters, after six-plus decades of avoiding this mostly unknown piece, The Grand Duke rises to a wonderful evening of great musical performances, funny skits and skirmishes, and a panorama of color and style. - Secrets shared among the actors/conspirators only after first eating sausage rolls, which by now all detest and most refuse to eat. - Bloodless Statutory Duels occurring for control of the kingdom, where guns are substituted with a deck of cards (including those ‘up the sleeve’) to see who draws the highest card and losers who “die,” but not really. - Our to-be-married actor Ludwig (who actually is now the new Grand Duke via above-mentioned “duel”) marrying four brides in twenty-four hours as maidens of various nationalities and ages keep showing up claiming (actually usurping) the ‘role’ (after all this is an acting group’s coup d’état). - The entire duchy becoming a set for the acting company’s Shakespeare tragedy since something has to be done with the costumes of the play that was to have premiered but was interrupted by the takeover of the kingdom by the troupe. Throw in a visiting Prince of Monte Carlo quite ready to demonstrate (in song and full Can-Can) his newly discovered ‘roulette,’ and then imagine that these are only a few of the elements of this rambling tale. What is truly commendable is that the Lamplighters troupe, as directed spectacularly by Barbara Heroux, has been able to recreate this troubled G&S rambling rarity in a version that is actually easy to follow. That may not mean that every line of the rapid-fire lyrics and sometimes heavily accented dialogue is completely understood. (I found I often kept my eyes more on the projected superscript than I did on the stage action.) The crazy rhymes, repeat choruses, and funny word juxtapositions of every Gilbert and Sullivan show are all here; but the Duo’s final creative venture seems to have been written on steroids. Speed of complicated words is often at Mach One, and the very talented Chorus and Principals do a magnificent job trying to keep up with the pace. If there are questions about this silly theatrical product and its overall worth among its Gilbert and Sullivan peers, there are no questions about the performance of the cast. To a person, each sings with great aplomb, beauty, and fun (as appropriate). As the foppish Grand Duke Randolph, Chris Uzelac excels every moment he is tittering and tripping on the stage. He is hilarious as he portrays a ruler who is supposedly a despot but who comes off as actually adorably silly (and a bit of a cowardly lion). As the actress Julia Jellicoe who demands the role of Grand Duchess (since in the new order, positions in the duchy are to go in order of playbill prominence), Jennifer Ashworth sings glorious arias, plays slapstick scenes with ease, and really dominates many moments in ways wonderful to watch and hear. Robby Stafford’s Ludwig sings with admirable baritone finesse and is also the bumbling fool needed for the role of actor who wants to be king and dresses in ancient Greek attire and a Parthenon-columned crown. As his initial intended (and his final bride in the every-thing-set-aright happy ending), Michele Schroeder sometimes over does her pouting and pounding about the stage, but she absolutely hits all the right notes when she sings with clear, very sweet soprano voice. And the large, on-and-off the stage (many times) Chorus are troubadours extraordinaire as they sing and dance their plotting of coup, take over and rule, and final submission to the rightful Duke. In the end, The Grand Duke certainly is not a show I would want to sit through quite as often as other Gilbert and Sullivan classics; but I certainly hope that it will not be another 62 years before Lamplighters once again visits the Duchy of Pfennig-Halbpfennig.